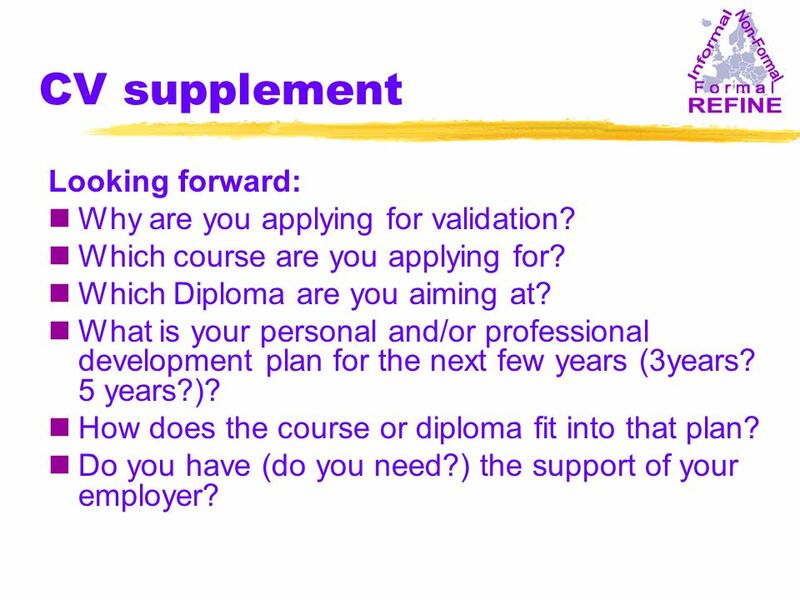 6 CV supplement Looking forward: nWhy are you applying for validation? nWhich course are you applying for? nWhich Diploma are you aiming at? 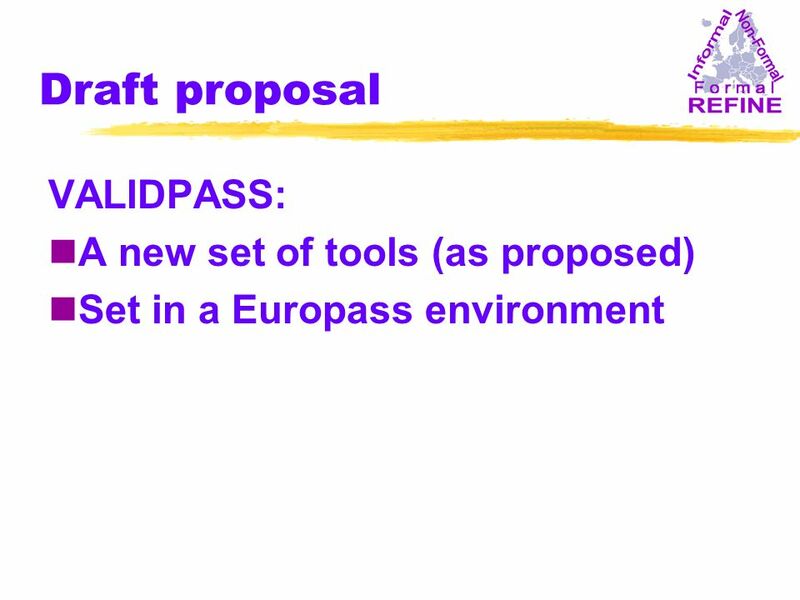 nWhat is your personal and/or professional development plan for the next few years (3years? 5 years?)? nHow does the course or diploma fit into that plan? nDo you have (do you need?) the support of your employer? 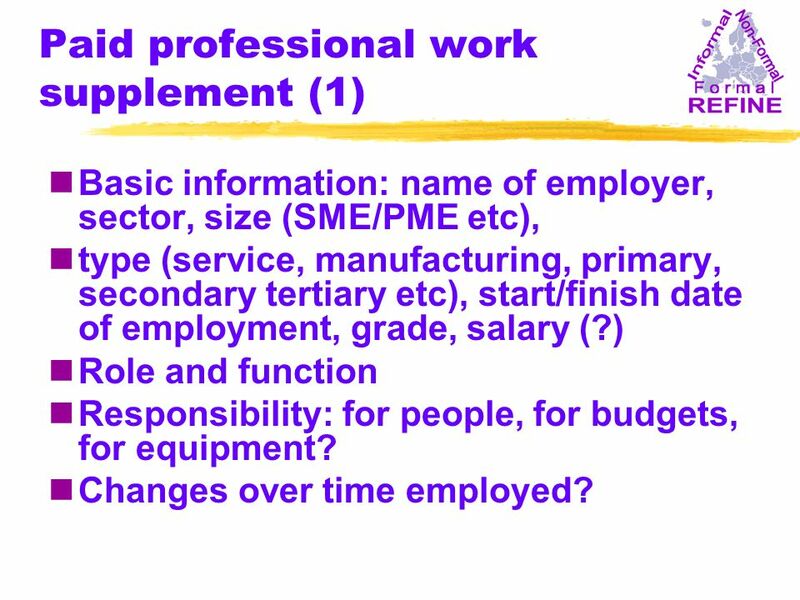 7 Paid professional work supplement (1) nBasic information: name of employer, sector, size (SME/PME etc), ntype (service, manufacturing, primary, secondary tertiary etc), start/finish date of employment, grade, salary (?) nRole and function nResponsibility: for people, for budgets, for equipment? nChanges over time employed? 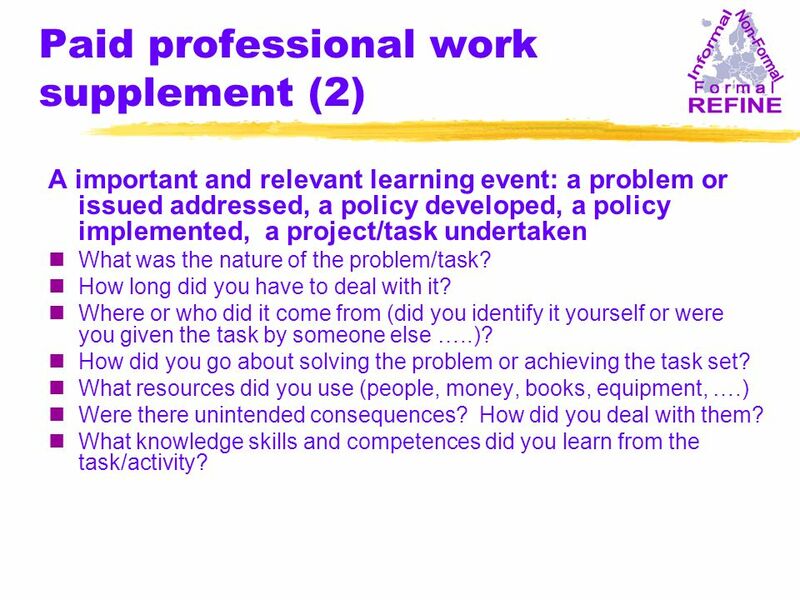 8 Paid professional work supplement (2) A important and relevant learning event: a problem or issued addressed, a policy developed, a policy implemented, a project/task undertaken nWhat was the nature of the problem/task? nHow long did you have to deal with it? nWhere or who did it come from (did you identify it yourself or were you given the task by someone else …..)? nHow did you go about solving the problem or achieving the task set? nWhat resources did you use (people, money, books, equipment, ….) nWere there unintended consequences? How did you deal with them? nWhat knowledge skills and competences did you learn from the task/activity? 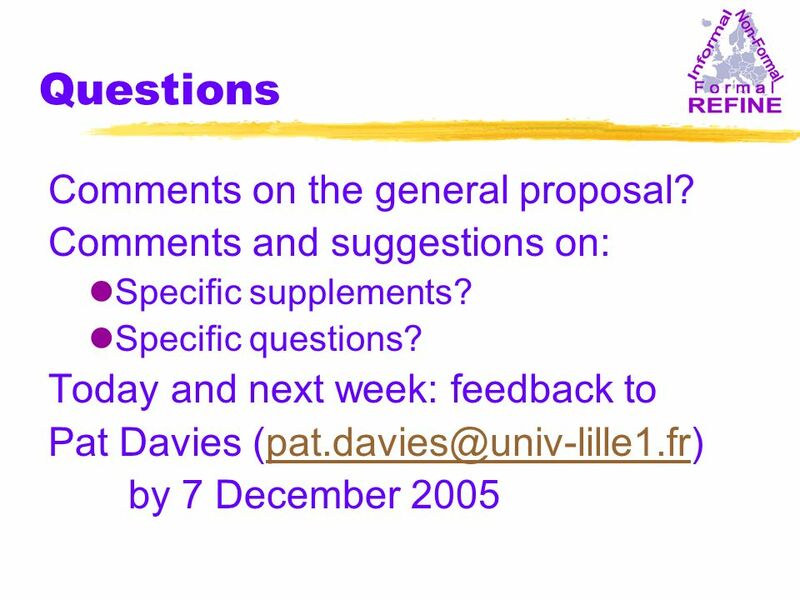 9 Voluntary activity supplement (1) nBasic information: name of organisation/NGO, sector, size (local, national, international), user group, type of activities offered, start/finish date of involvement, amount of time given (e.g. hours per week) nRole and function, activities nResponsibility: for people, for budgets, for equipment, for users? nChanges over time involved? nWhat are your dreams? (A question to try to get at the values of the individual) nWhat was your motivation for getting involved with this organisation (e.g. the philosophy, education or social aim, the people….)? nWhat intercultural experience do you have? 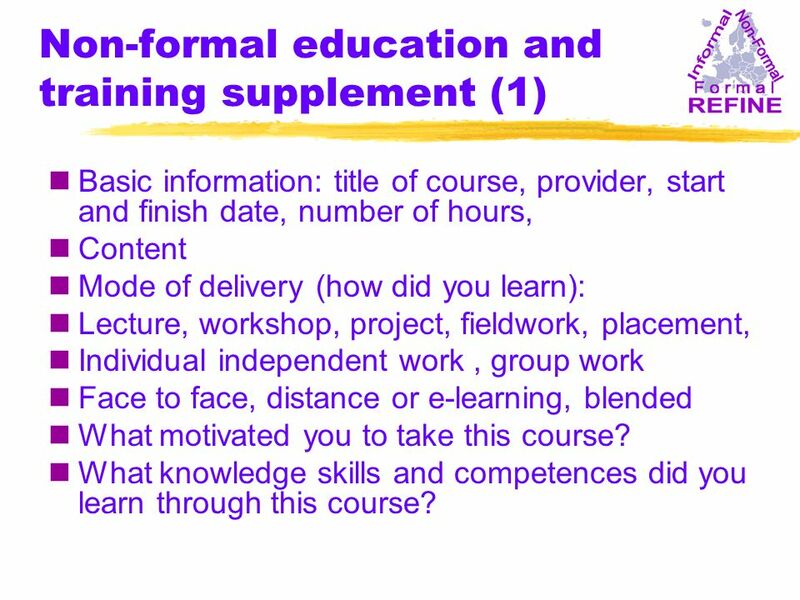 11 Non-formal education and training supplement (1) nBasic information: title of course, provider, start and finish date, number of hours, nContent nMode of delivery (how did you learn): nLecture, workshop, project, fieldwork, placement, nIndividual independent work, group work nFace to face, distance or e-learning, blended nWhat motivated you to take this course? 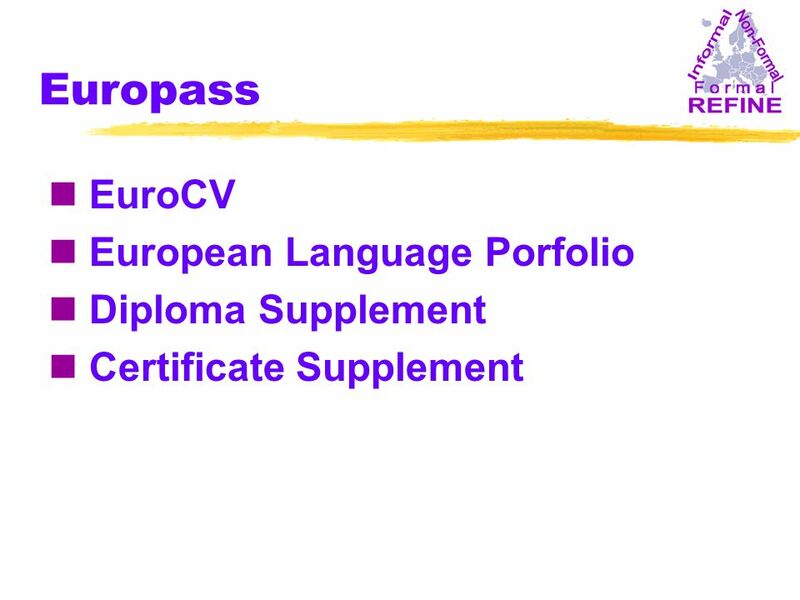 nWhat knowledge skills and competences did you learn through this course? 13 nWhat was the nature of the event of incident or activity? nWhen was it? How long did it last? 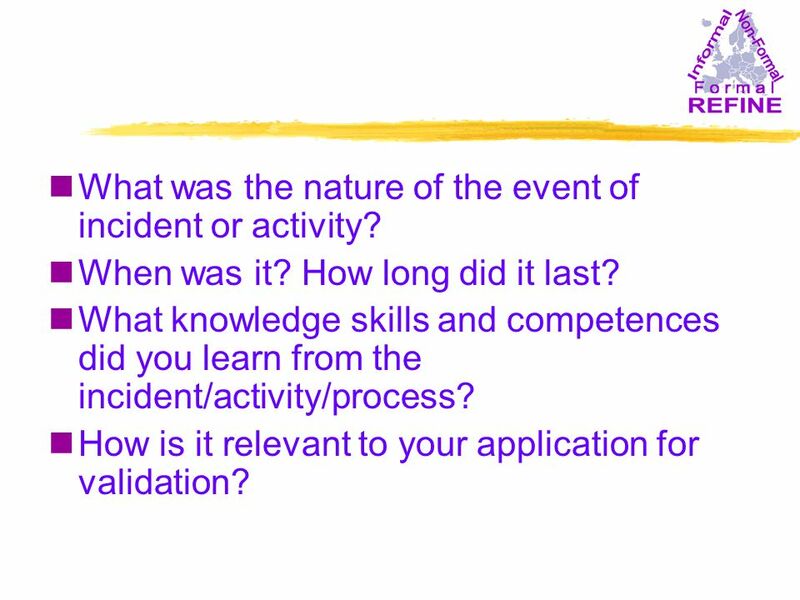 nWhat knowledge skills and competences did you learn from the incident/activity/process? 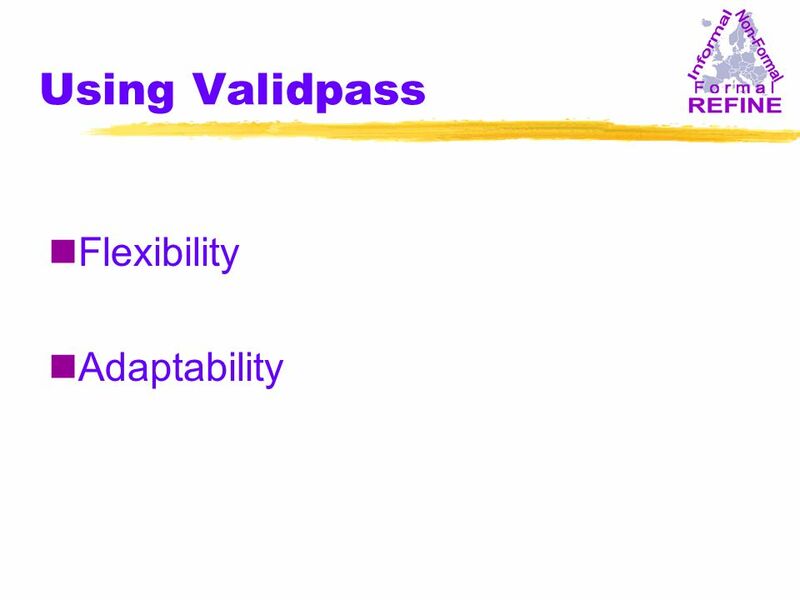 nHow is it relevant to your application for validation? 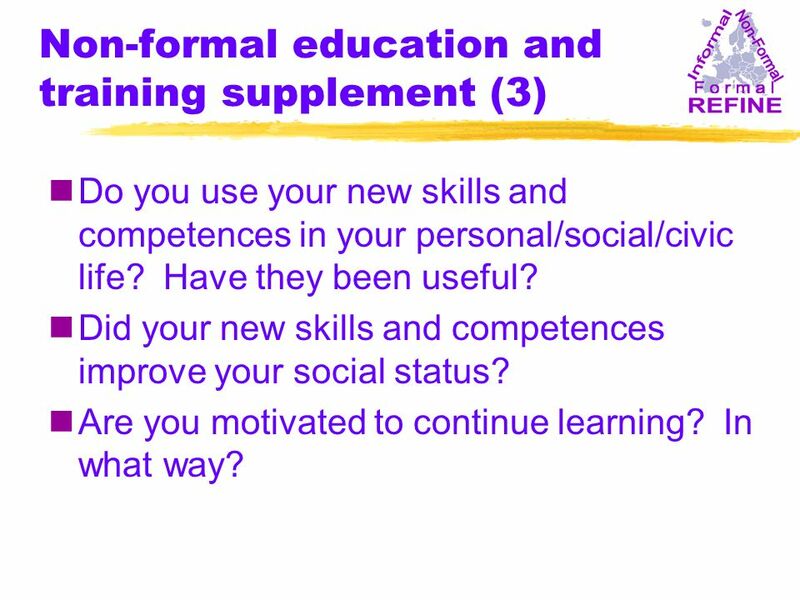 14 Non-formal education and training supplement (3) nDo you use your new skills and competences in your personal/social/civic life? Have they been useful? nDid your new skills and competences improve your social status? nAre you motivated to continue learning? In what way? 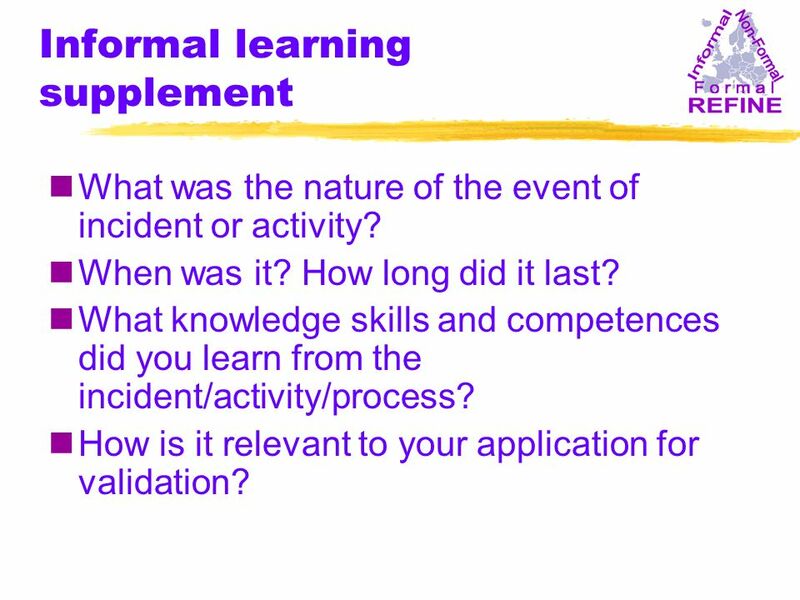 15 Informal learning supplement nWhat was the nature of the event of incident or activity? nWhen was it? How long did it last? 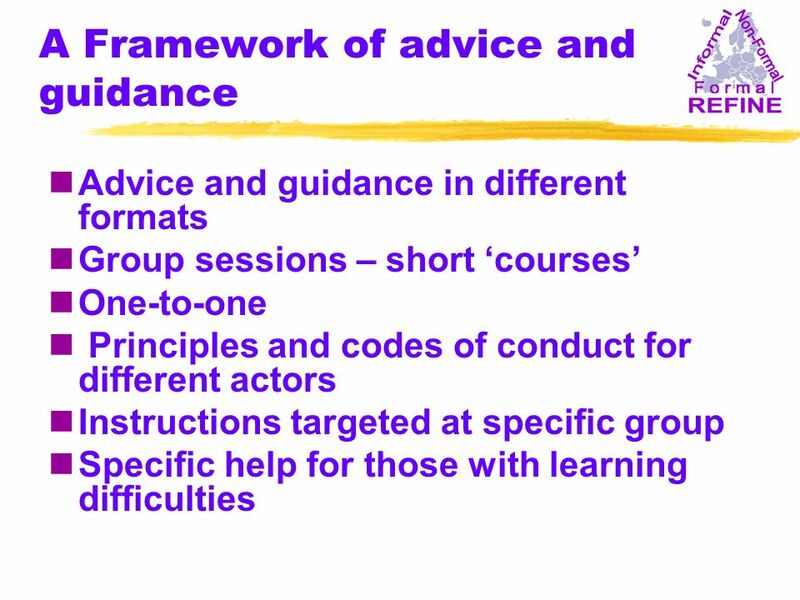 nWhat knowledge skills and competences did you learn from the incident/activity/process? nHow is it relevant to your application for validation? 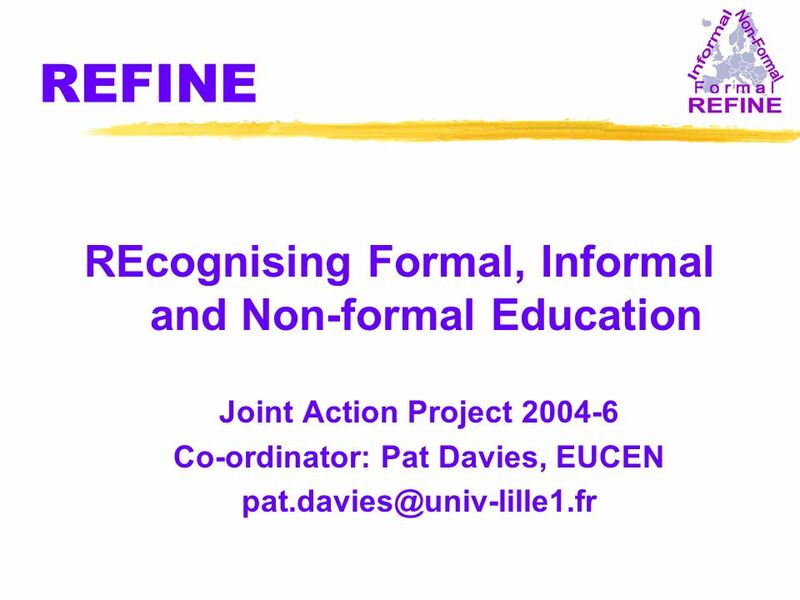 Download ppt "REFINE REcognising Formal, Informal and Non-formal Education Joint Action Project 2004-6 Co-ordinator: Pat Davies, EUCEN"
Vienna, October 2005 Towards a National Qualifications Framework Practices and projects from TVET and HE ROMANIA Lucian Ciolan Sorin Zaharia MoER. Work Based Learning Susie Bissell, Placement Officer University of Plymouth. Team Leader Presentation: Collecting Outcomes. Introduction The Changes: Three month outcome form no longer in use Hard outcomes collected by text message. Youth Academy Recreational Activity Study Book Recognition of learning in youth voluntary free-time activities Example from experience. Professional Career Skills Resumes & Interviews Presentation by Lynda Rohan Monash Careers and Employment October 12, 2005 School. On and Off the Job Training - Danish Experiences By Leon Østergaard, Statistics Denmark UNECE/OECD Work Session on Statistical Dissemination and Communication. Centres to support the integration of foreigners In Czech republic Short presentation by Zdeněk Horváth. EUROPEAN LANGUAGE PORTFOLIO & GLOBAL LANGUAGE PORTFOLIO Title VI 50 th Anniversary Conference (March 19, 2009) Patricia W. Cummins Virginia Commonwealth. Tallinn, 19 November 2009 Mike Coles Qualifications and Curriculum Authority, London The EQF – a platform for collaboration, integration and reform.